Mobile phone signal strength is fine with some network providers but non-existent with others. 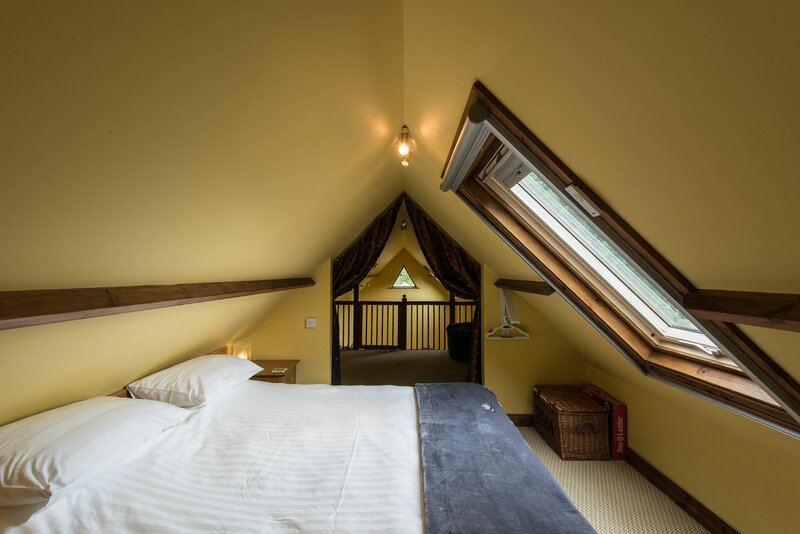 Accessed by some steep wooden steps from the lounge is a cosy bedroom nestled in the mezzanine of The School Annex. 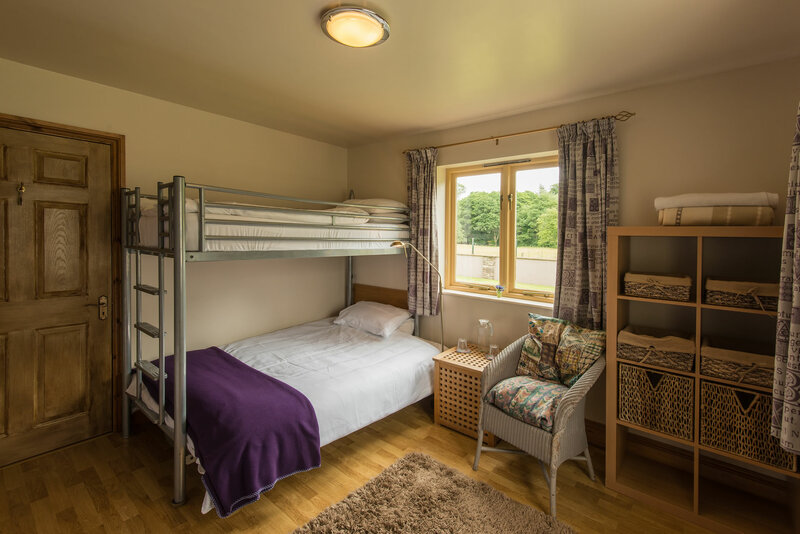 With sloping ceilings, this large room has both sleeping and "Chill Zone" and can sleep two on a super king sized bed or three on single beds, depending on your requirements. 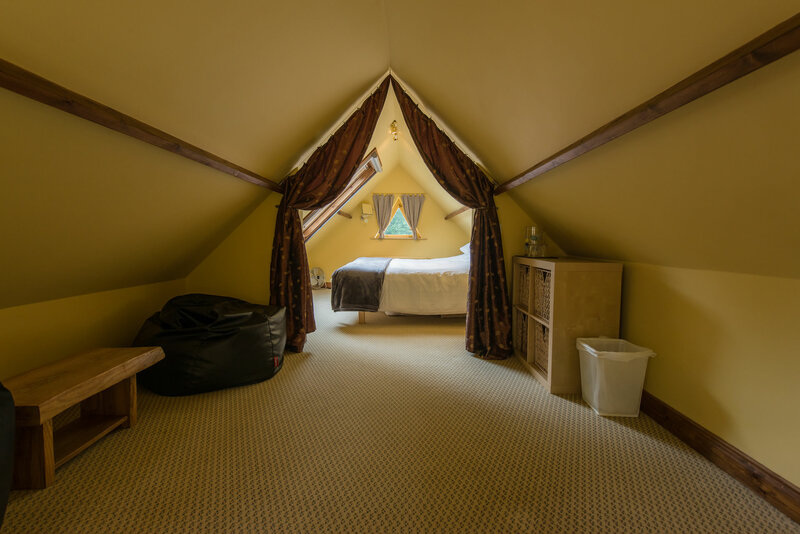 A "Chill Zone" adjoins the Mezzanine Bedroom - a relaxing area with low sloping ceilings and big, comfy beanbags. Great for lazing with a book or for an afternoon snooze. This area is where a single bed can be sited, by arrangement. Tea and coffee making facilities are located in the lounge area. The bedroom is not suitable as sleeping space for young children. The ground floor bedroom has a double bed with a single bunk above. A single occasional bed is also available for this bedroom if needed. Tea and coffee making facilities are immediately on hand. The bedroom can be accessed via a private outside door through the study or from the main entrance. 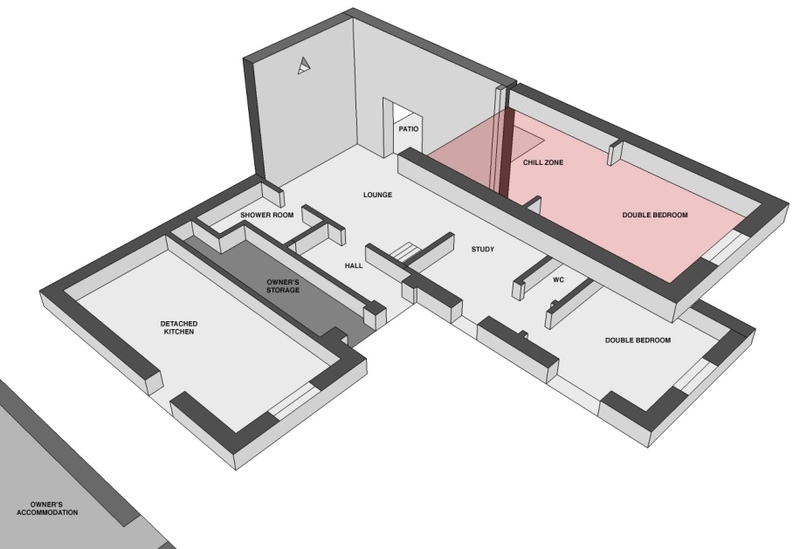 There is a separate toilet and wash basin in the adjacent study area. The double height lounge is a light and airy room with all you need to wind down and relax. The lounge has a TV with freesat from Sky, a DVD player with a good selection of films provided. 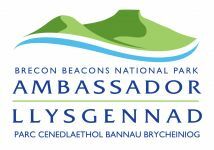 There is also a selection of books and games for your enjoyment along with a star gazing kit to help you get the most out of the dark night skies. The patio doors from the lounge lead out onto your own patio area with table, chairs, BBQ and firepit. 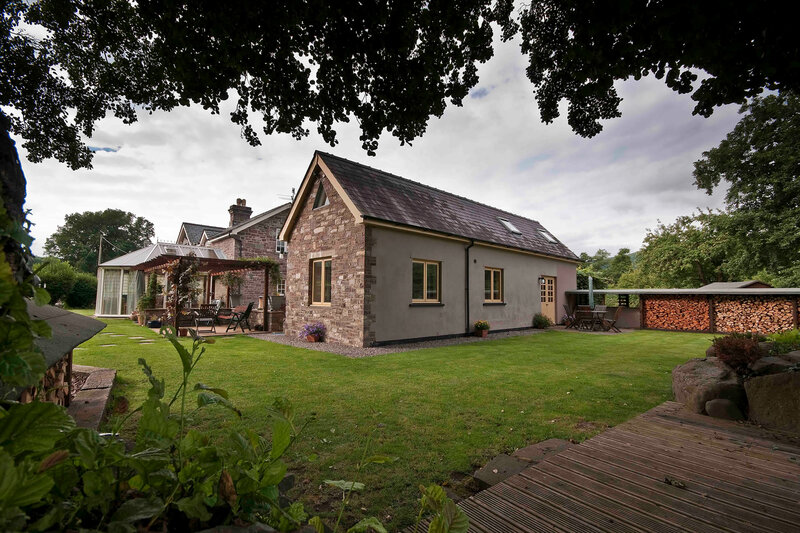 The self catering property boasts a spacious detached kitchen which has views of the beautiful Brecon Beacons countryside. 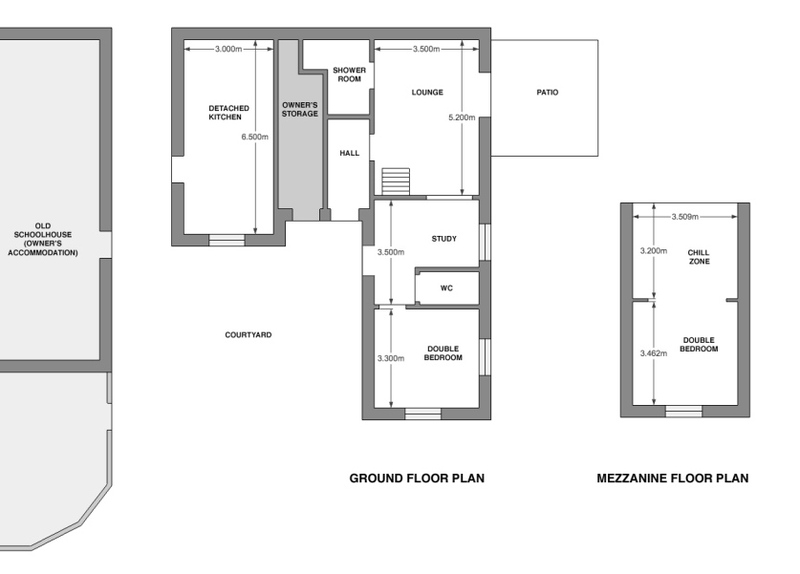 The large kitchen/diner is just a dozen steps away from the living accommodation across an external courtyard. 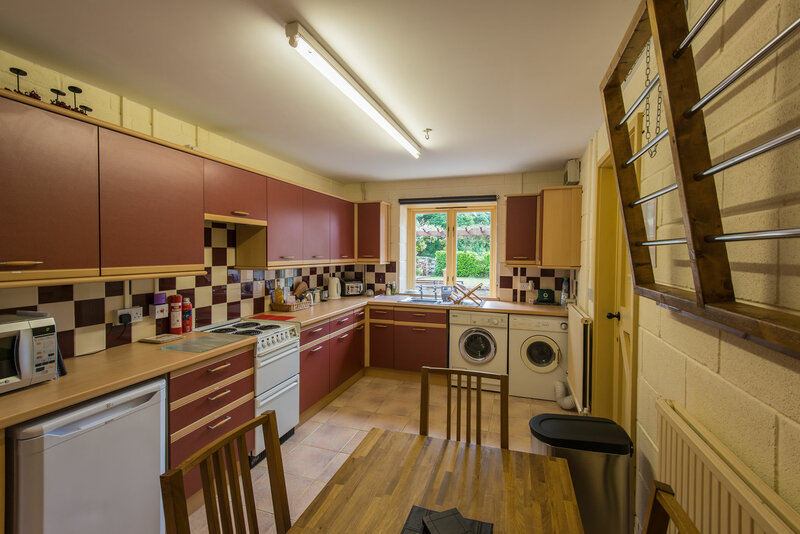 Well-equipped with an electric cooker, microwave, fridge and washing machine, the kitchen also has a large clothes airer/dryer and a dining area plus a dart board at the back. 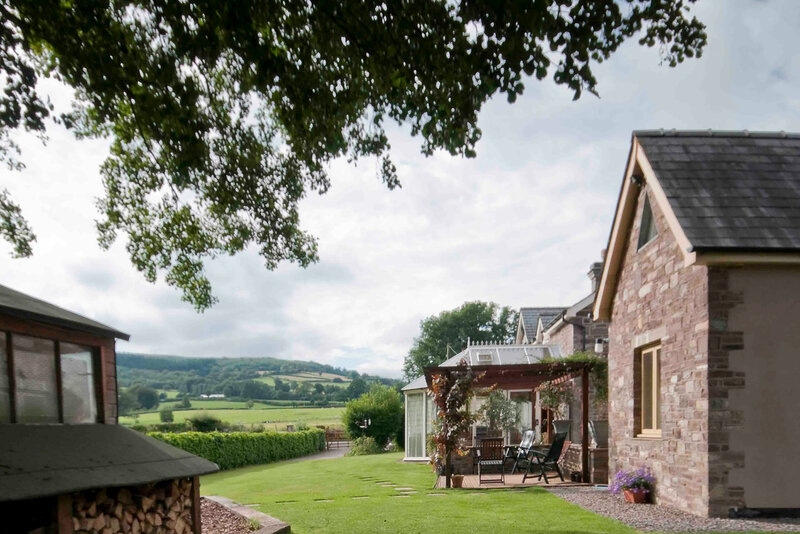 While the self-catering School Annex is across the courtyard from the Old School House, access to the separate kitchen is opposite the back door of the owners' residence, with spectacular views across the owners' patio area towards the Brecon Beacons. The lounge and ground floor bedroom of the self catering property are separated by a study area. The School Annex has free Wi-Fi internet access from an ethernet connection from a hub in the adjacent owners' residence. There is one main shower room on the ground floor situated off the lounge. 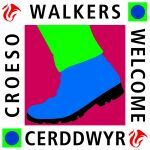 There is a toilet, wash basin, shower, heated towel rail and an electric fan heater to make sure you are warm and cosy. There is also a separate toilet and wash basin in the study area next to the ground floor bedroom. 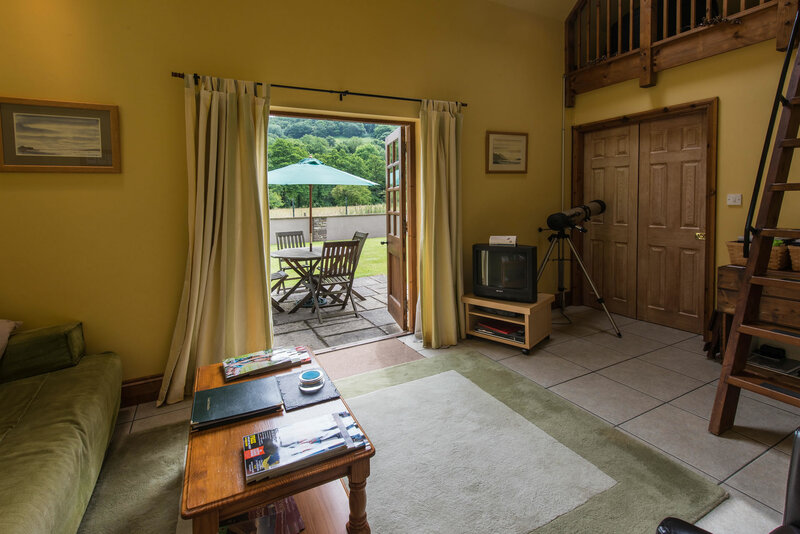 The self catering School Annex has a private terrace, from which you can enjoy beautiful views of the Brecon Beacons. The terrace has garden furniture and a BBQ. If you have young children, note that there is a small mill stream at the bottom of the garden. There is dedicated, private off-road parking for two cars. Further off-road parking is available close by. 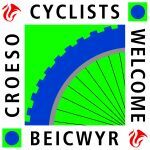 If you are bringing mountain bikes or cycles with you for your stay in the Brecon Beacons, the School Annex has storage and hose-down facilities.